Yesterday I shared a Canadian article, and last year a letter from two OBs opposing a hospital VBAC ban, which discuss the risks of cesarean sections including placenta accreta and hysterectomy. Today I want to share a study that measured the increasing risks that come with multiple cesareans, but before I do so, lets do a quick review of definitions. In a normal pregnancy, the placenta attaches itself to the uterine wall, away from the cervix. Placenta accreta is a placenta that attaches itself too deeply and too firmly into the wall of the uterus. Placenta increta is a placenta that attaches itself even more deeply into the uterine wall. Placenta percreta is a placenta that attaches itself through the uterus, sometimes extending to nearby organs, such as the bladder. A hysterectomy (his-tur-EK-tuh-mee) is a surgery to remove a woman’s uterus or womb. The uterus is where a baby grows when a woman is pregnant. The whole uterus or just part of it may be removed. After a hysterectomy, you no longer have menstrual periods and cannot become pregnant. Placenta previa is a complication of pregnancy in which the placenta grows in the lowest part of the womb (uterus) and covers all or part of the opening to the cervix. Marginal: The placenta is next to cervix but does not cover the opening. Today’s study is Maternal morbidity associated with multiple repeat cesarean deliveries (Silver 2006) which included over 30,000 women undergoing up to six cesareans over four years. (Download the full text PDF.) 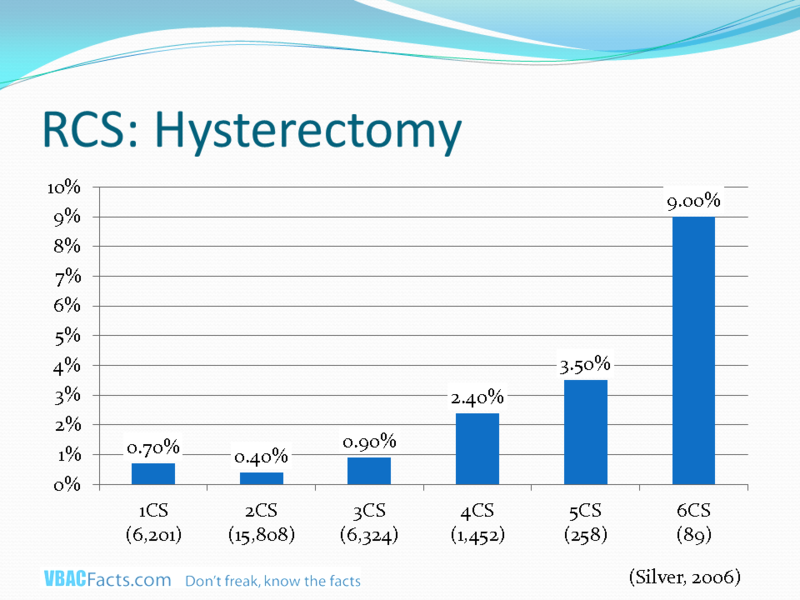 Silver measured the complication rates per cesarean number. And their findings are important to every mom pregnant after a cesarean. Keep in mind that all the cesareans included in the Silver (2006) study were scheduled and performed without medical indication except for the first cesarean. All the complications noted were a direct result of the surgery, not of any other medical complication. The risks of placenta accreta, cystotomy [surgical incision of the urinary bladder], bowel injury, ureteral [ureters are muscular ducts that propel urine from the kidneys to the urinary bladder] injury, and ileus [disruption of the normal propulsive gastrointestinal motor activity], the need for postoperative ventilation, intensive care unit admission, hysterectomy, and blood transfusion requiring 4 or more units, and the duration of operative time and hospital stay significantly increased with increasing number of cesarean deliveries. 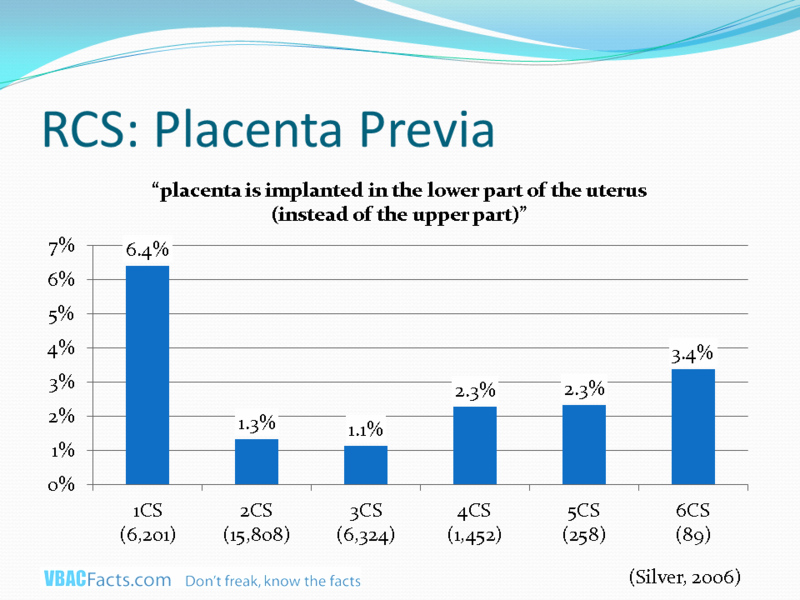 Below are some slides from the VBAC Class I developed and teach illustrating the rates of placenta accreta, previa, previa with accreta, and hysterectomy by number of cesareans (Silver 2006). The number below the cesarean number indicates how many women were included in that category. Remember as you look these over, the risk of uterine rupture in a spontaneous labor after one prior low horizontal (“bikini-cut”) cesarean is 0.4% (Landon 2004). 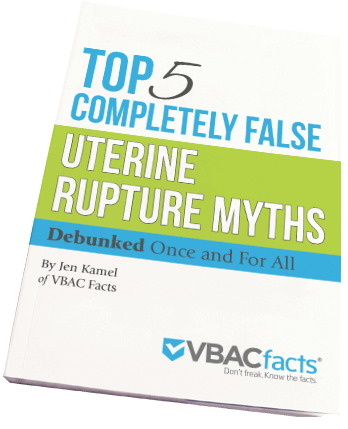 Risk of uterine rupture during one’s second cesarean is 0.9% (Landon 2006). I was especially interested to see the relationship between previa and accreta. 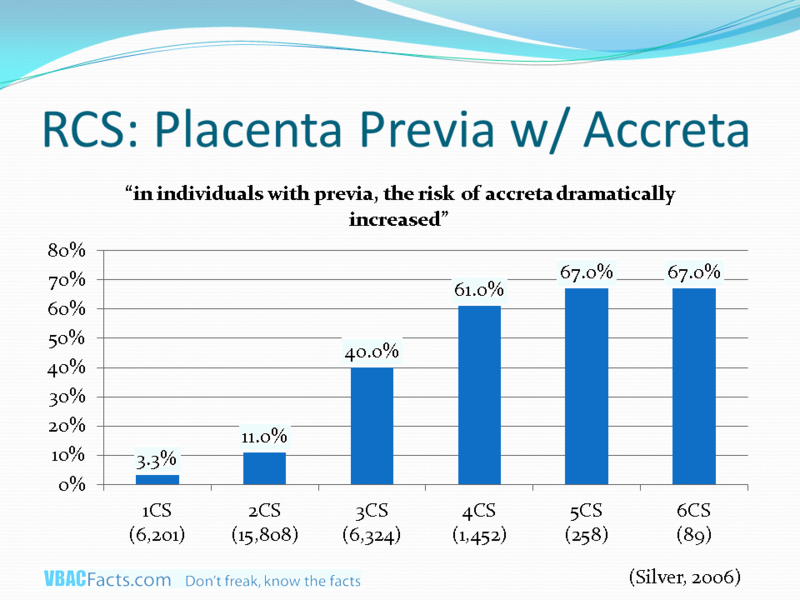 Silver (2006) found that if you have previa, you are very likely to have accreta and that risk increases with each cesarean. For example, if a woman has one cesarean and is diagnosed with previa in her next pregnancy, her risk of having accreta is 11%. That risk jumps to 40% in the third pregnancy, 61% in the fourth pregnancy and 67% for the fifth and sixth pregnancy. Accreta is nothing to mess around with as it has a very high rate of maternal mortality (up to 7%) and morbidity including hemorrhage and hysterectomy. Fang (2006) asserted, “abnormal adherent placentation [is] the primary indication leading to emergent peripartum hysterectomy…. As the number of prior cesarean deliveries rises, the risk of cesarean hysterectomy increases dramatically.” In other words, all these primary cesareans and repeat cesareans are causing placentas to abnormally implant in subsequent pregnancies. As a result, many women who have placenta accreta end up having hysterectomies as that is the best way to control the hemorrhaging that results from accreta. In the majority of cases, hysterectomy is the most effective way to manage the potentially fatal consequences of placenta accreta. Unfortunately, however, most cases of placenta accreta are not discovered until the last minute. And, because a hysterectomy results in infertility, some women may want to consider more conservative options. using x-ray guidance to inject gelatin sponge particles or spring coils into the blood vessels that nourish the uterus (this procedure usually is not feasible in emergency situations.) This procedure requires help from interventional radiologists, doctors who specialize in advanced treatments for bleeding. Reported success rates of these procedures vary widely. In one recent study, 31 cases of placenta accreta were managed without hysterectomy; there were no reports of infertility or maternal death. All the statistics I have shared above are from hospital based studies where women have access to operating rooms, surgeons, and blood products. I suspect that the likelihood of a mother dying from hemorrhage due to placenta accreta is significantly higher in an OOH (out-of-hospital) birth. This is why I think it is completely reasonable to have an ultrasound or MRI to try to diagnose accreta when planning a OOH birth. 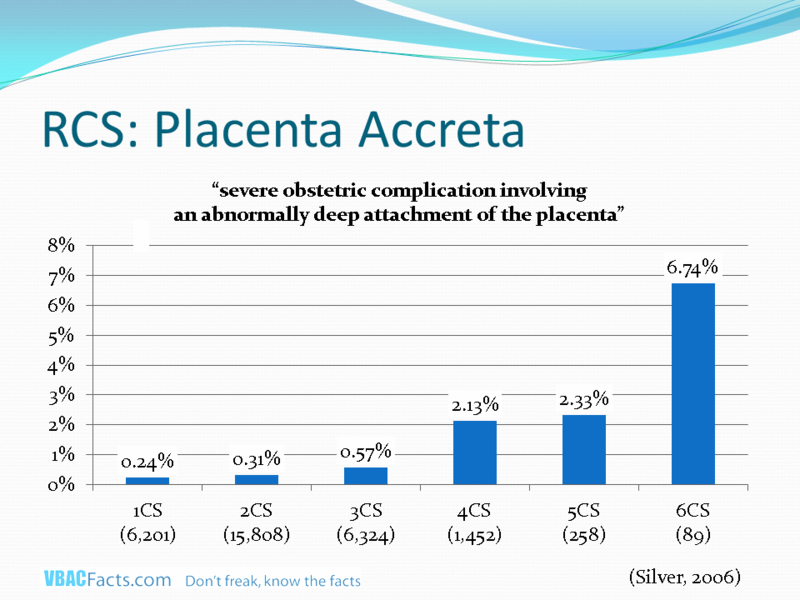 Sonography correctly identified the presence of placenta accreta in 14 of 15 patients (93% sensitivity) and the absence of placenta accreta in 12 of 17 patients (71% specificity). Magnetic resonance imaging correctly identified the presence of placenta accreta in 12 of 15 patients (80% sensitivity) and the absence of placenta accreta in 11 of 17 patients (65% specificity). In 7 of 32 cases, sonography and MRI had discordant diagnoses: sonography was correct in 5 cases, and MRI was correct in 2. What difference does it make if you know you have accreta before delivery? Because accreta has a high maternal mortality and morbidity rate, a hospital plans for a birth with accreta (usually a cesarean if diagnosed before labor) very differently than a birth (cesarean or vaginal) without known accreta. 6. local availability of a level 2 critical care bed. Taking this extensive preparation into account, I suspect that women fare better when accreta is diagnosed before delivery. RCOG’s clinical guidelines also included evidence that of women who were diagnosed with previa early in their pregnancy, women with a prior cesarean where less likely than an unscarred mom to have their placenta “move” enough to permit a vaginal delivery at term (50% vs. 11%). Since the study in question included over 700 women with previa, this is a large enough study to give us good evidence. Women with a previous caesarean section require a higher index of suspicion as there are two problems to exclude: placenta praevia and placenta accreta. If the placenta lies anteriorly and reaches the cervical os at 20 weeks, a follow-up scan can help identify if it is implanted into the caesarean section scar. Conversely, although significant migration to allow vaginal delivery is unlikely if the placenta substantially overlaps the internal os (by over 23 mm at 11–14 weeks of gestation in one study,54 by over 25 mm at 20–23 weeks of gestation in another52 and by over 20 mm at 26 weeks of gestation in a third study57), such migration is still possible and therefore follow-up scanning should be arranged. I looked up source 53 and it’s Dashe (2002) which shared: “The outcome of the study was persistent placenta previa resulting in cesarean delivery. This diagnosis was based on clinical assessment and ultrasound at time of delivery.” You can read Dashe in its entirety by clicking on this link and then looking for the “Article as PDF” link on the right hand side. Many women who don’t plan on having more children do not think these complications are applicable. But I know many women, and I’m sure you do too, who were not planning on more children, but got pregnant nonetheless. This is consistent with the CDC’s findings that 49% of pregnancies are unintentional. Unless you or your partner get sterilized or practice abstinence (what fun! ), the chance of you getting pregnant, and experiencing these downstream risks, are there. It’s important when evaluating your current birth options to consider how that decision will impact the risks of your future pregnancies as well as your future delivery options. Thank you for this very informative and helpful article. I feel it is so important for women to know the facts! It does no good to be afraid. Knowledge – the truth- is SO important! Thank you for giving us that! I have had 4 C-sections in my life time. After that delivered VBack. When I was having babies there were no doctors that would allow me to have a normal delivery. It was not until I found a brave midwife who would help me and allow me to do a VBack. I am so thankful for her and my wonderful husband who helped me accomplish that task. The Lord has been so good to me to have kept me alive and with out major complications from my C’s. I delivered my last baby at the age of 45. I try hard to encourage all I know who have had C’s to do all they can to go VBack. My daughter just had a VB and was so amazing with her determination to complete the process. She and the baby are both Strong and healthy. It can be done and it is so much safer for both Mom and baby. I am glad all this information has been offered. I hope more will read it and know that VBacks are totally possible, and a much healthier choice. I was recently given the article to read from McMaster University in Hamilton, Ontario, Canada. As I am considering having my 6th cs. This was never an elective surgery for me, my 1st pregnancy I went 1 mth overdue and was induced. To this day I have never even had a contraction, no doctor has even been able to explain to me why. This article is the only information that doctors were even able to give me to help me make this decision. I want to have more children and wish there was another way. I also know that if I do choose to have another one that I should not try again after this one. I have had no serious problems in the past with my surgeries, the last my bladder moved and they had to cut it away and put it back. Scarring is always excessive which is expected and the doctor always cleans it up as much as possible. I want to know where I can find more information before I make this big decision. I am 39 years old, extremely healthy and in great shape, I work out at least 3 times a week. I have never seen any of the studies describing any of the patients. I have always concentrated on recovery and doing all I can to make sure my recovery is successful and trying to build my muscles back up again. Overall my thoughts after reading the study….it is a bit confusing as you do need to figure out the percentages separately as it is misleading when looking at the number of CS. What I am also gathering is that most of the injuries that can happen can be fixed and are not life threatening. I will be going back to my gynecologist and discussing this article with her and checking to see that the hospital in my area can even deal with the problems that may arise at time of delivery if I do decide to do this, whether the blood bank is there, other operatable staff is available etc. So many factors to decide, it would be easier if they had installed a zipper. If anyone has more information that can help me with this serious decision, it would be greatly appreciated. I as in the exact same situation as you, I was woundering if you went ahead with your sixth child? I would love that! Could you mail me a copy? I’ll email you privately with an address! Great post. I especially love the last line of the abstract where they recommend this data as part of the debate prior to primary elective cesarean. Of note is that in the definition for placenta accreta the rate is 1 in 2,500, but in the study the rate was 1 in 416 for women undergoing their first cesarean. That is a very scary number, and one I’m not too sure of. I wonder if the setting had anything to do with it. Either way, these are important risks which need to be discussed. Thanks! Great visuals! I would love to see those stats drawn all the way out to “no previous c/s” Because the risk is not zero, but heck of a lot less than after even 1 cesarean! Because it is key to prevent that first one! Thanks again for all your dedication! We live in a world so afraid of birth. As the coordinator of the Australian support group of CARES-SA ( caesarean Awareness, recovery, education and support) http://www.cares-sa.org.au and a VBAC mum myself,and a GP, it is studies like these you can use, to show that an ” elective caesarean” is not the ” safest ” choice to have, which is what most OBs here – especially in the private health system really belive.